That’s Matt West, chief operating officer of Premier Surgical Associates. Premier is eastern Tennessee’s largest surgical provider, and its 28 physicians perform more than 15,000 general, vascular, bariatric and oncology surgical procedures a year and see upwards of 1,000 patients in office visits each week. West notes that few physicians look forward to their time spent on call, yet all recognize the vital need for rapid and clear communications between doctors and patients after normal hours. They weren’t happy with the old system, and they were letting West know. One of the office locations in Premier’s practice group was already using PerfectServe on a limited basis, and the facility’s office manager encouraged West to take a look. After seeing what PerfectServe had done with its algorithms and how well the company understood the requirements of Premier’s IT systems, West was convinced he’d found the right partner for the whole organization. “We didn’t see this kind of customization from any other company,” he notes. Each doctor can choose or change how he or she wants to be contacted, from any device and inreal time. Users can send messages, add attachments or make callsfrom within the PerfectServe app, keeping communications secure. The real test of any system is how it handles after-hours calls from patients. West notes that any patient calling after hours has a medical issue or concern and is anxious to hear back. PerfectServe helps Premier manage the communications workflow to ensure rapid and effective response. 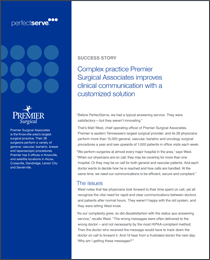 Implementing the PerfectServe platform across the entire Premier Surgical Associates organization took about four months. PerfectServe and Premier worked together closely to fine-tune the system as it was deployed. Working collaboratively with PerfectServe, Premier came up with a plan to easily resolve the issue: now patients just select their doctor. If the doctor’s not available, the message is automatically routed to the doctor on call. Driving adoption of a new system across an organization also presents challenges. Early adopters may embrace a new technology from the start, while others resist leaving the tried and true. West notes that the simplicity and intuitive functionality of the PerfectServe app soon won over even those who were least comfortable with digital technology. West reports that physicians and staff especially value the detail and accuracy of information that PerfectServe puts at their fingertips. Because the Premier staff is copied on all physician after-hours messages, when they come in the next morning they can simply review the messages and quickly decide if they need to follow up with a patient or doctor. An added bonus has been the organization’s ability to use these detailed messages to help track and improve billing for consults and other physician tasks that the old system didn’t track. West also deeply appreciates not having to worry about HIPAA compliance.